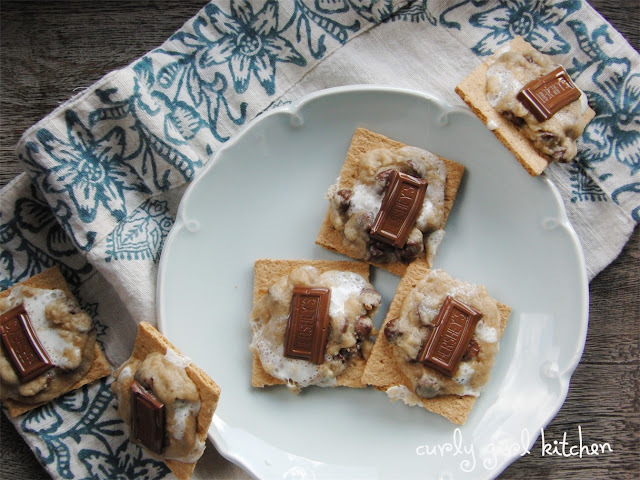 Although S'mores are thought of as a summer treat, I personally think they're more fun in the fall, when the nights are getting cooler, and a warm, crackling fire after sunset is a little more welcome. Camping in the summer, when it's too hot to even sleep at night and you wake up in the morning, already sweating in the hot tent, isn't really my favorite thing to do. But in September and October, when there's a brisk chill in the air, there's few things I like better than wrapping up in a blanket next to the fire, and roasting marshmallows to golden brown perfection. Growing up in South Carolina, our house was heated with a wood-burning stove with a wide brick hearth in the living room, so we had a cozy fire every night when it started to get cold. Winters there could get pretty chilly, especially on a damp, rainy winter day; if we were lucky, the rain would turn into snow, which meant a snow day home from school. I loved gathering newspaper and splinters of wood for kindling and lighting the fire; my parents used to think I was going to grow up to be a pyromaniac because I was so fascinated by the process. To fuel my fire-loving tendencies, my dad taught my brother, sister and I a few fire tricks with candles - how to run our fingers through the flames without getting burned, how to blow them out and then relight them through the smoke... And nothing draws a kid's curious fingers like a really, really drippy tapered candle. I wasn't all happy when my mom started buying drip-less candles to prevent me from picking at the drips of wax. With fall comes football - something I could care less about - but Jamie and his friends do the whole fantasy football thing every fall, so for their first get together for the draft, I baked up a batch of cookies for them that represent all things warm, cozy and fall-ish. 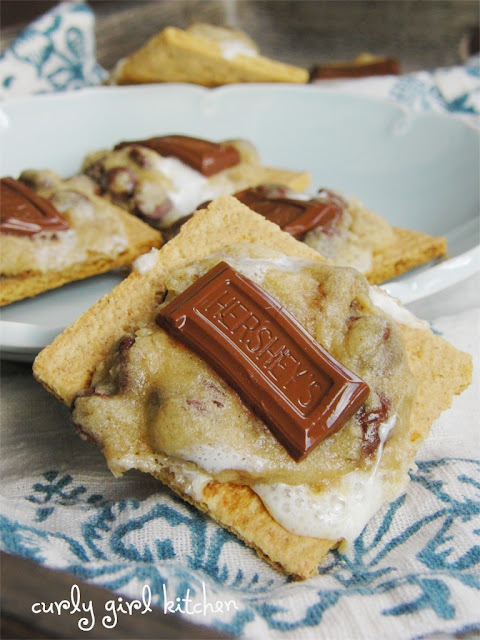 A combination of chocolate chip cookies and S'mores - scoops of chocolate chip cookie dough with marshmallows, baked on top of graham crackers, and topped with a piece of Hershey's chocolate. Warm from the oven they were gooey, melty and rich. 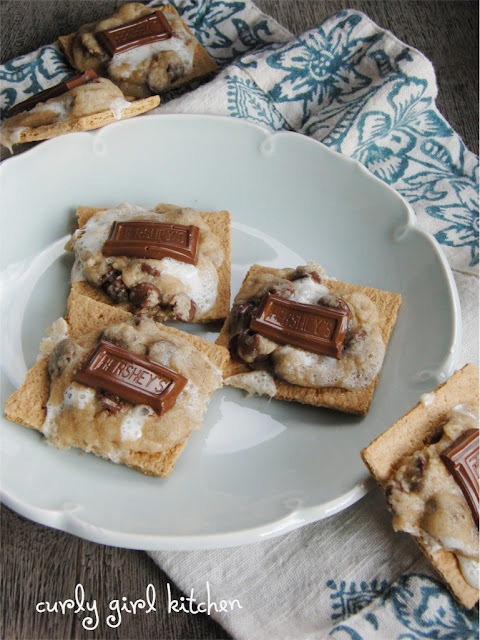 The next day, they might have been even better, with the crisp graham cracker base, the soft, chewy cookie on top, and the sweet milk chocolate. With an electric mixer, beat the butter, sugars and vanilla until well combined, 1-2 minutes. Beat in the egg. In a separate bowl, combine the flour, baking soda, salt and cinnamon. Stir into the batter until moistened. Stir in the chocolate chips and marshmallows. Cover and refrigerate for two hours, or overnight. Preheat the oven to 350. Line two baking sheets with parchment paper. Place the graham crackers on the parchment paper. Shape the cookie dough into rounded tablespoons, then flatten slightly between your hands. 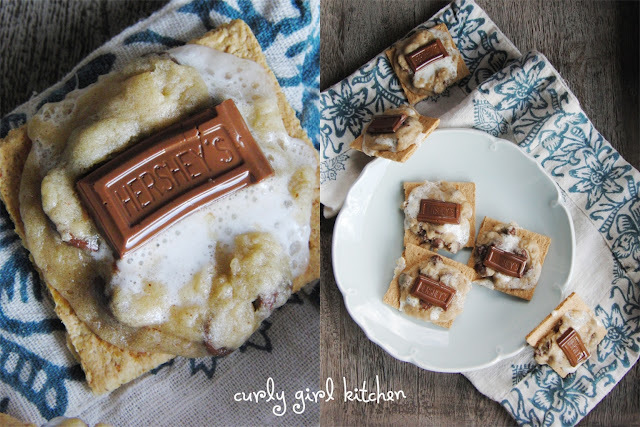 Place cookie dough balls in the center of each graham cracker. 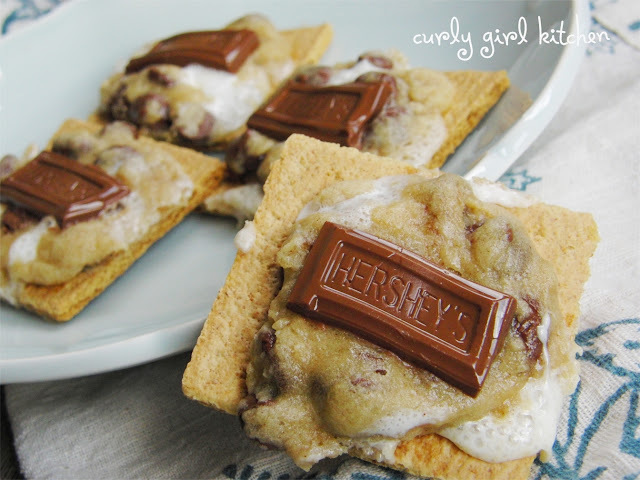 Bake for 6 minutes, then remove from the oven; place the pieces of Hershey's chocolate on each cookie and press down slightly. Bake for an additional 3-4 minutes.